The history of water use and technologies to bring water to human societies is long, particularly in some of the world's most arid regions where human-settled societies first began. Water technologies evolved as other technology developed, the social organization became more complex and states developed. While we often think of Roman aqueducts as marvels, which they were, other complex water technologies existed much earlier. Wells would have been also constructed for ancient villages. In particular, many early villages were located on hills or higher ground, which allowed them to be better drained and avoid flooding in the wet seasons. However, this created the problem of easily accessing water. This led to the development of wells, as water underneath these hilly areas could be easily accessed. What is critical for these early systems is that they forced societies to better organize labor for construction and maintenance, which helped to encourage more complex organization and state formation. In essence, canals and irrigation likely had a significant role in the development of some early, complex state societies developing in Mesopotamia and the Indus region. In Arabia, already new forms of water capturing technologies may have developed. This includes surface channels and dams to capture water from the highlands and bring the water down to lowland region. Some have suggested that underground channels, called falaj/qanats, were developed, but this is not universally accepted. Figure 2. Qanata system (arrows) showing the access holes. Underneath lies a tunnel that would have carried water to agricultural fields. Probably one of the most important developments to enable more advanced water technologies was the development and use of iron. The increasing sophistication of mathematics and engineering by the 1st millennium BC, along with iron technology, enabled the next major phase of development for irrigation technologies to occur. With the use of iron, rock could be excavated more easily. This advance facilitated the development of more sub-surface irrigation features, including tunnels and qanat systems (Figure 2), which were tunnels with access holes that brought water from highland regions to lowland areas. These qanats also required a large amount of engineering, as channels had to be cut across mountains or difficult hilly areas, while channels were sometimes even cut from different areas and were met some place in the middle. Surface channels cut into mountain rock were now also developed, which allowed the capture of water from elevated regions. During the Iron Age (early 1st millennium BC), another significant development occurred, which is when the construction of aqueducts began. The first aqueduct we know of developed in northern Iraq, just north of the city of Mosul. This aqueduct, part of an extensive canal system bringing water to the city of Nineveh, enabled water to be delivered over different watersheds. In other words, it now allowed societies to build irrigation features that crossed natural elevation change that would have restricted where you could irrigate. Irrigation and water technologies have been critical to human societies for millennia. The first great use of water technologies probably began soon after the development of settled societies. However, as societies became more complex, technologies such as iron, and mathematics improved. These developments allowed these civilizations to use of water technologies in more sophisticated ways. It is arguable that irrigation technologies helped to encourage or speedup the development of complex, state societies, as it required a greater organization and control of labor. The issue of water management, in essence, becomes critical or important for state development. Furthermore, qanats and aqueducts, both invented probably by the Iron Age in the early 1st millennium BC, are still in use today, showing the durability of this technology. Some qanats and aqueducts used today, in fact, date to the Roman period. Similar to irrigation channels, qanats also had a major role in influencing societies, as it enabled regions of Iran and other areas that were more sparsely populated to become more greatly settled, changing the direction of history as Iranian-based empires began to become the norm. ↑ For examples and discussions of early irrigation systems, see: Mashkour, Marjan, Andrew M. Bauer, Tony J. Wilkinson, Nicholas Kouchoukos, and Abbas Alizadeh. 2004. “Human-Environment Interactions on the Upper Khuzestan Plains, Southwest Iran. Recent Investigations.” Paléorient 30 (1): 69–88. doi:10.3406/paleo.2004.4773. ↑ For an example of irrigation systems in Neolithic China, see: Hu, Linchao, Zhihong Chao, Min Gu, Fuchun Li, Lina Chen, Bending Liu, Xia Li, et al. 2013. 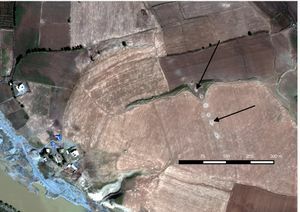 “Evidence for a Neolithic Age Fire-Irrigation Paddy Cultivation System in the Lower Yangtze River Delta, China.” Journal of Archaeological Science 40 (1): 72–78. doi:10.1016/j.jas.2012.04.021. ↑ For an example of an early Neolithic well-based village and system, see: Garfinkel, Yosef, Ariel Vered, and Ofer Bar-Yosef. 2006. “The Domestication of Water: The Neolithic Well at Sha’ar Hagolan, Jordan Valley, Israel.” Antiquity 80 (309): 686–96. ↑ For information about 4th millennium BC canals and irrigation in southern Mesopotamia, see: Wilkinson, T. J. 2003. Archaeological Landscapes of the Near East. Tucson: University of Arizona Press, pg. 89. ↑ For information on early Arabian irrigation and types of features, see: al-Jahwari, Nasser Said. 2009. 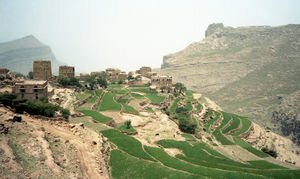 “The Agricultural Basis of Umm an-Nar Society in the Northern Oman Peninsula (2500-2000 BC).” Arabian Archaeology and Epigraphy 20 (2): 122–33. ↑ For more information on these Iron Age developments, see: Solomon, Steven. 2011. Water: The Epic Struggle for Wealth, Power, and Civilization. New York: Harper Perennial. ↑ For more information on the role of qanats in developing settled societies and empires, see: Christensen, Peter, and Steven Sampson. 2016. Decline of Iranshahr: Irrigation and Environment in the Middle East, 500 BC-AD 1500. Copenhagen: Museum Tusculanum Press.